A total 185 works by Takashi Amano from 1985 to 2009. 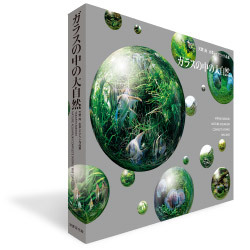 Takashi Amano's complete works, Glass no Naka No Daishizen (in Japanese) will be released on the end of December. This showcases a total of 185 works by Takashi Amano from 1985 to 2009. It includes many unreleased new works and his essays about nature and environment. It is highly recommended for Nature Aquarium hobbyists and nature lovers. • All color 268 pages. Takashi Amano Photo Exhibition, The world of eyesight 6.0 "The Unknown Scenery of Niigata"
Glass no Naka no Daishizen, French version now available! Takashi Amano's photographs displayed at Shinkansen concourses of train stations. Announcement on winning the 63th Niigata Daily News Culture Prize Award (Art activity division)! Takashi Amano's new photobook "THE LAST AMAZON"
Takashi Amano's documentary DVD is now available! New photo book, "SADO – To Primitive Forest from Bottom of Sea"
Takashi Amano Photography exhibition in Doha, Qatar. Takashi Amano Photo exhibit at G8 Hokkaido Toyako Summit.